What you are seeing is most likely from the stress of being in a new place. It is normal for the bird to be quite nervous for the first few days. Make sure that the cage is in a quiet spot and it may help to cover the cage on 3 sides leaving only the front exposed, this will help to make the bird feel more secure. Do not attempt to hold or pet the bird, the only hand in the cage at this point should be to change the food and water and clean the cage papers at the bottom and do that quietly and slowly. Depending on the age of a child this can sometimes be difficult for them to understand because they want so much to interact with the bird but interaction should not be rushed or pushed on the bird as it will only serve to make the bird more nervous. You can sit at the side of the cage and talk or read softly to the bird to get it used to your presence. It can take quite some time to train a bird and to have them be comfortable enough to interact with you so be very patient and go at the birds pace. There are many great articles on the forum about all aspects of care, please take a look at them and if you have any questions please ask. What have you named the bird? Would love to see pictures once the bird is more comfortable in its new home. Thank you for the information. Today the budgie seems to be doing better, the wings are not out from the body anymore but the tail is still bobbing. How long till I should take them to a vet if the tail doesn't stop? 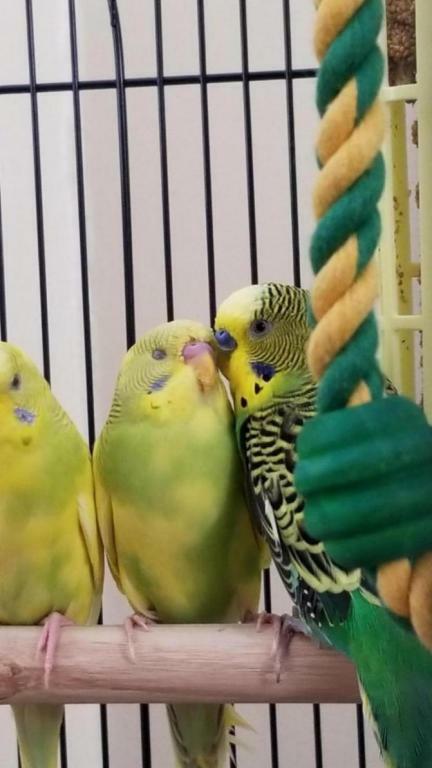 The budgies name is pineapple and I have 3 total lemon and kiwi are the other two. Your birds are adorable. It appears that you have already put Pineapple in the cage with the other two. It is recommended as a best practice that all new birds be quarantined for at least 30 days before introducing them to other birds. This is done to prevent the spread of illness should the new bird be harboring anything. It requires that the new bird be kept in a different cage, ideally in a separate room. A slight amount of tail bob is normal but if you feel that it is pronounced after a few days you may want to have the bird examined, birds hide illness very well and with the stress of being in a new home if there are any underlying issues now is the time they will manifest. I am assuming you have not seen any sneezing or discharge from the nares, if you have then the bird needs to be seen by an avian vet, the sooner the better. Cody has given you some excellent advice above. Your budgies are beautiful! Please make sure to read up on the Stickies we’ve provided in each forum section. You’ll find answers to questions, and useful advice on keeping your budgies at their best . All 3 birds were purchased the same day from the same petshop. Pineapple is very talkative and eats and drinks just fine no discharge from of any kind and droppings are normal. She does seem to have more of a tailbob then others and seems to be breathing a little bit stronger then the other 2 she has a vet appointment on Monday so hopefully all works out. She may be just a bit more nervous than the others and that is causing her to breathe a bit more rapidly, hence the more pronounced tail bob. Hope everything checks out ok at the vet. From the pictures posted, it appears that Pineapple is a little boy. He has a lovely smooth pinkish/purple cere which indicates he is a male. It is best that budgies be kept with their budgie family until they reach at least 8 weeks old. As Pineapple is only 7 weeks, he is going to be less confident and it will take time for him to adjust. I'm glad you have an appointment with the vet for him on Monday to ensure he is in good health. I recommend you remove the wooden dowel perches in the cage and replace them with natural wooden perches of varying diameters to help prevent pressure sores. You've been given great advice above and I agree totally. I hope that Pineapple feels more comfortable in his new home soon! Meanwhile, be sure to read through the links provided above to ensure you're up to date on the best of budgie care practices! If you have any questions after doing so, please do ask as we'd be happy to help.